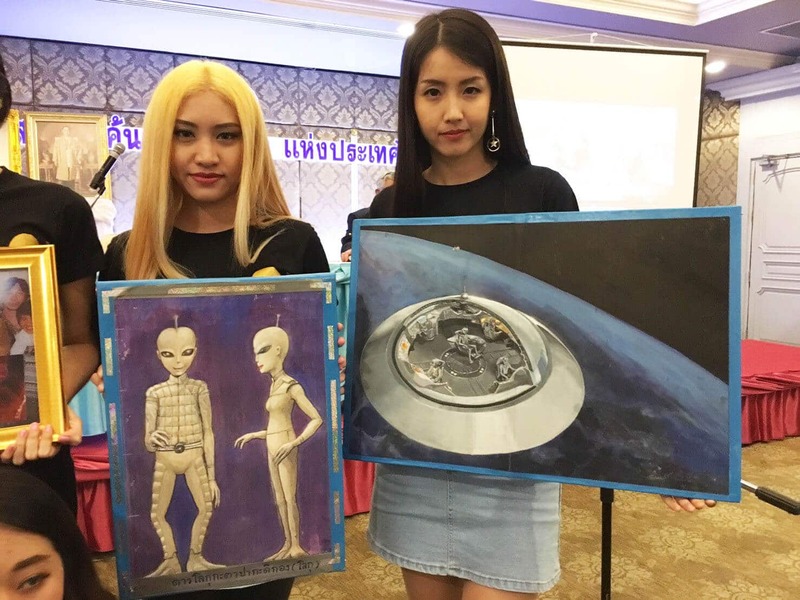 Top: Members of UFO Kaokala, a group that trains in meditation to seek answers and prophecy from extraterrestrial life, Saturday at a convention held in a Bangkok hotel. It only took stepping into the brown-carpeted conference room of a grungy Bangkok hotel to enter a dimension of belief where aliens not only exist (and think we’re stupid) but communicate with a select few Thais over the psychic plane. This is the UFO Kaokala group, and on Saturday more than 200 members gathered to hear their leaders relate the latest prophecies gleaned from their otherworldly advisers, sip on the Royal Rattanakosin Hotel’s sugar-water tea, seek the use of their extraterrestrial gifts and puzzle over the outside world’s lack of belief. “There’s some people today that still don’t even believe in aliens,” a woman said to low chuckles and murmurs of shared incredulity from the audience. Somjit shows the audience her depiction of some aliens from Pluto she communicated with. That woman was Somjit Reapeth, who is tasked with overseeing Alien Communications for the group. Somjit and the rest see a rupturing world just out of reach to the vast wisdom offered by the aliens zipping around the universe who have banded together in an intergalactic Federation. To those cosmic travelers, Earthlings are savage, spoiled children who can’t evolve past devising new ways to kill each other. Members believe in extraterrestrial life and practice meditation to communicate with said life. Most are middle-aged, middle-class people of various backgrounds, from office workers and medical professionals and underemployed free agents. All are Buddhists who say xenology and studying alien teachings not only comports with but enhances Buddhist spirituality. Kuntamestha Fhanataweenantha, a 39-year-old personal financial planner, has been a member since 2009. He said aliens tell him about natural disasters to come, and even what is to happen in his personal and professional life. Kuntamestha Fhanataweenantha, a 39-year-old personal financial planner, shows a portentous YouTube video he created in 2011. “Within six years, the volcanoes along the Ring of Fire will erupt, and tsunamis will harm Chile, San Andreas and especially Yellowstone,” Kuntamestha said, referring to the nation, a seismological fault line in California and US national park. He said that he uploaded a video just before the 2011 Tohoku earthquake and tsunami warning of the catastrophe about to hit Japan. Talking to aliens, for Kuntamestha, is tantamount to religious development. One might expect the whole thing is a scam cult to squeeze money from the gullible. But apart from the entry fee of a few hundred baht and a small merch table selling T-shirts and photos, Saturday’s event wasn’t about money. Instead, uninitiated visitors found an earnest (if slightly paranoid) group of New Agers with some wild ideas practicing the kind of good ole’ ufo religion that emerged in the ‘60s and ‘70s. UFO Kaokala members believe that by meditating and developing one’s own mental abilities, they can project their brainwaves and talk to extraterrestrials, while developing their dharma along the way. They draw heavily from mass media representations of extra-solar life. Somjit compares her extraterrestrial experiences with what’s represented in sci-fi movies. So why are they talking to a 58-year-old Thai nurse? The group’s senior members are called ajarn and respected for their advanced abilities, said to be sharpened by alien training. What in other realms of Thai belief are mediums and fortune tellers, the UFO Kaokala ajarn bring some of the same abilities to bear, albeit with sci-fi underpinnings. Dephanom Muangman, a Harvard-trained, former heart surgeon, demonstrates the use of his EMF meter to detect the proximity of extraterrestrials. As speakers on the stage Saturday talked about alien prophecies of natural disasters and world wars, women queued in front of Paprongpong Chamoo so he could scan their bodies for disease with his alien-honed psychic abilities. Dephanom Muangman, a former heart surgeon who studied medicine and earned his doctorate at Harvard, is often in the news for his alien-related warnings. On Saturday, he showed off the electromagnetic field meter he uses to detect when aliens are near. Those present Saturday ranged in zealousness. There are the senior members, who treat their alien training and prophetic powers with a kind of professionalism. In the crowd, find the more fervent, sweatier believers who create paranoia-pitched YouTube videos and alien testimonials, along with a smattering of the alien-curious who may have never been on a UFO-watching hiking trip themselves. Their belief and the group’s name trace to a mountain in the central province of Nakhon Sawan. That was where Somjit said she first saw aliens back in 1998, leading the group’s first to receive messages through meditation. Khao Kala, it would turn out, was the go-to place for alien encounters in Thailand, as they frequently land there or fly by because Khao Kala is a convenient place for them to cross over dimensional barriers. Since then, it’s become the epicenter of UFOlogy, with frequent sightings and alien-watching retreats held here by UFO Kaokala. For more information, check out UFO Kaokala and the Thai-language Kaokala Disaster Alert, which largely disseminates alien-born prophecy on wars and natural disasters. ‘The aliens say we aren’t very clever, since we always make weapons to kill each other and destroy the world with. They are mentally superior; we are like children to them. Whether you believe in them or not, you’ll encounter them soon.’ Somjit Reapeth, one of the group’s founders and present Alien Communications Officer, speaks at Saturday’s convention. She claims to have contacted aliens and showed footage of what she said was a UFO spotted at Khao Kala. ‘It was a black, shape-shifting ship that flew in zig-zags and was made of metal panels. Once, they even took me back in time. I checked my phone clock, and it said 4:28. Then I played with my dog for what felt like a long time, and when I checked my phone again to see, it was 4:23.’ Science fiction writer Papronpong Chamoo, 38, scans a woman using telepathic alien skills for diseases in her body. Papronpong is one of the members who claims to have their ‘basal dharmic brain wave’ enhanced by alien training. Papronpong, who joined in 2010, said UFOs would fly around his house all the time when he was a child. ‘I saw them with my own eyes. Now, I’m working towards communicating with them. The aliens pick who to communicate with based on who’s ready.’ Tararat Thongcharoen, 26, second from left in back, joined the group because she was interested in developing her dharma. A documentary about UFO sightings on Khao Kala.